When Union Pacific decided to look into the possibility of restoring a Big Boy to operational condition, UP Senior Manager of Heritage Operations, Ed Dickens, found that more than the favorable climate in Pomona, California had allowed 4014 to remain in good condition despite years on display outdoors. Thanks to many thousands of hours of work by two members of the Southern California Chapter of the Railway & Locomotive Historical Society (R&LHS) the engine had been kept painted, lubricated and much more by Paul Guercio (also a UPHS member) and Rick Brown. 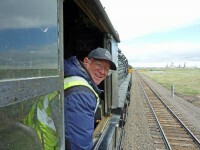 In addition, both helped the steam crew prepare the engine for the trip to Cheyenne. 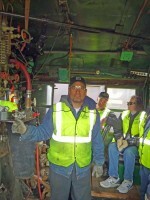 Here they are in the cab of 4014 on the ride over to Cheyenne.